The Spooky Vegan: Giveaway: Win Tickets to This Weekend's GRAVE HARVEST Halloween Fest! 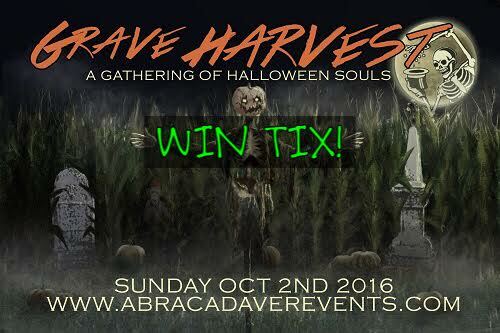 Giveaway: Win Tickets to This Weekend's GRAVE HARVEST Halloween Fest! UPDATE - CONTEST CLOSED! Thanks to all that entered, the two winners have been notified! I'm so excited that Orange County gets to experience the first ever Grave Harvest Halloween fest this Sunday, October 2nd, 2016! It seems like the perfect way to kick off October and get us ready for Halloween, especially since we'll be able to browse for Halloween goodies from a variety of vendors, have books signed by horror authors, visit with horror actors, and even attend interactive workshops to hone your haunt skills! And now I'm giving away two tickets to the event that you have a chance to win! This event is being brought to us by the lovely folks of Abracadaver Productions, hosts of OC's summertime Halloween market [my coverage here] and I'm so happy that their events are getting so popular! In fact, Grave Harvest is being held at the spacious Hotel Fullerton to allow for over 50 vendors, presenters, haunts, and special guests! So much Halloween goodness awaits! Tickets are $15 and parking is free. I have two tickets to give away, so if you would like a chance to win a FREE ticket, email spookyvegan AT gmail.com with the subject line GRAVE HARVEST GIVEAWAY and include your name. You must be able to provide your own transportation to the event (so you should live in the SoCal area). I'll choose two winners this Friday, September 30th and notify them via email. Good luck and hope to see on Sunday! To learn more about the event, purchase tickets and see the full lineup of vendors and guests, check out Grave Harvest's website! You mean you are not going to fly me out there Sarah? Sounds like a blast. Unfortunately, I am not in the area - boohoo.